There’s a trend in indoor design to make rooms with plenty of space and light, and this trend is also popular in outdoor design. But, what if you’re considering building a new Melbourne carport and the ideal location is a little tight and dark? Are there ways to help increase the space and light that you can implement? While the length and depth of your new Melbourne carport may be dictated by aspects such as your home, fences and other aspects (even council regulations) one dimension you may have more control over is height. Adding more height to your carport roof can be practical, particularly if have a higher item to store such as a caravan, and can make a big difference in the perception of space. Attaching the roof of a carport directly to the fascia of your home is a common solution, but for extra height it’s best to use special brackets that connect to your home’s roof. The carport roof is then attached to these brackets, effectively raising the roof by a little or a lot, depending on the height of the bracket. A curved roof for your new Melbourne carport is another possibility for adding extra space underneath the structure. Another potential solution is to build a carport with a gable roof (that’s a roof with two roof sections sloping up from the sides to meet at the top. Adding more space underneath a carport using one of the solutions mentioned above will also help get more light in, but if your location is particularly dark (on the south side perhaps or overshadowed by trees or the house next door) you may need to do more. This is where polycarbonate roof sheeting really comes to the fore. Polycarbonate roofing is naturally transparent, lightweight, strong and impact resistant. Polycarbonate roofing can also be shaped, so while polycarbonate roofing can be flat, it’s also available in a range of different profiles to suit your style. Plus, you can even curve polycarbonate roofing to solve both height and light issues. An area with light and tightness issues was faced by Mr Carports when we were asked to build a new single carport in a Bayside area of Melbourne. To overcome the issues, our team designed and built a simple gable roof carport for the area. This helped to add the extra height that the carport needed and let more light in. To further improve light-entry, Colorbond metal roofing was combined with polycarbonate roofing. The result is a carport that feels larger than it actually is, and is light-filled (see main image on this page). 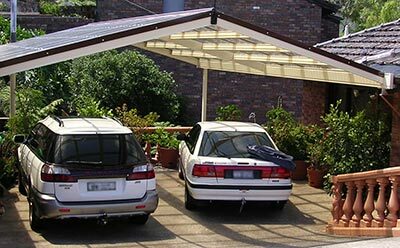 If you’re considering designing and building a new Melbourne carport, give Mr Carports a call on 1800 557 782. We’ll then organise a convenient time for a free, no-obligation discussion, design and quote.